A report issued by the National Resources Defense Council (NRDC) suggests that certain regions in the United States are far more dependent on oil than others, by ranking states by their citizens’ incomes by percentage spent on gasoline. The American South and Appalachia host the most heavily transport-gasoline dependent states, with Mississippians spending 8.98-percent of their incomes on gas, followed by West Viriginians who spend 8.1-percent of their total incomes on gas every year. The least gas dependent state was Connecticut -located in the transit, and intercity-bus and rail dense service area of the New York Metropolitan area- whose citizens spend only 3.51-percent of their income on gas. In the wake of Hurricane Sandy, the New York University Rudin Center for Transportation, has completed an assessment of local and regional transit service changes and damage affected by the storm in New York City. 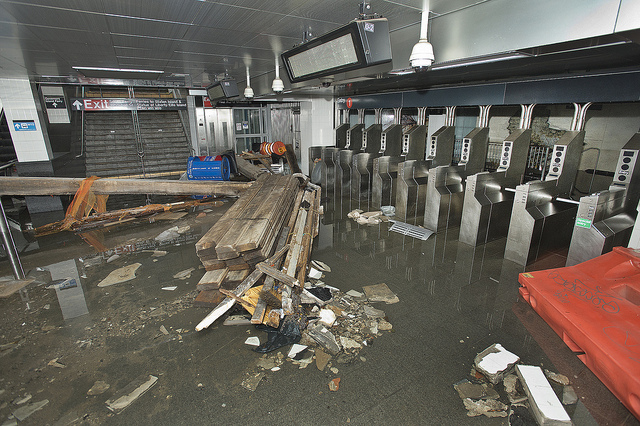 The report’s key findings for preventing some of the mass transit network’s failings include installing backup power for subway pumps (used in tunnels) and changing pavement types around stations in flood prone areas to absorb excess water. The European Federation for Transport and Environment (T&E) has found in its annual report, “How Clean Are Europe’s Cars” that the E.U. -wide auto industry has cut CO2 emissions by 3.3-percent over last year, and Toyota, PSA and Fiat have reached mandated emissions reductions well in advance of their 2015 deadlines. The report also indicates that European car makers are much more likely to achieve 2020’s 95 grams-per-kilometer E.U. mandated emissions rating on time, when compared to their Asian counterparts. The Washington, D.C. subway system, Metro, has seen declining ridership over the past six months, due to constant track work, delaying trains and transferring mode share. The 4.9-percent dip in Metro Rail travel is highly correlated to weekends, when such track work occurs, suggesting that the mode is still viable for commuting. The American Public Transportation Association, or APTA, has released its 3rd quarter nationwide ridership statistics, indicating a 1.1-percent increase in ridership from July to September of this year. Of the most transit rich metropolitan areas in the U.S., Atlanta suffered the greatest year-to-date downturn in ridership, taking an 8.5-percent dip of trips taken, and San Francisco and Cleveland experiencing ridership swells of 6.4-percent and 10.3-percent increases in trips taken respectively.